The post war rural economy is dependent upon the national markets, to ensure the income and economic development of the resettled farmers most of them are recently resettled in Visuvamadhu area in Mulliativu District, says the General Manger of the Visuvamadhu Young Farmers’ Co-operative Union. 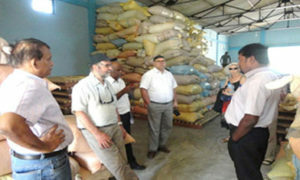 The production of paddy is the major produce in the area in the agricultural villages linked to this cooperative union, while the major agency is catering to the needs of the local population in the area. Supply of dry ration and other commodities, and services are provided by this cooperative union, but it lost its assets during the war says Mr. Jeyanthan the accountant. The union is slowly limping back to normalcy , but without this stores we wouldn’t have restored the market because without the stores facility we cannot procure the seasonal supply , which means the production will end up in the hands of the middlemen who will pay less price to the farmers for the paddy. Currently the stores were built with the assistance of RAHAMA and the farmers union. It can accommodate some 450,000 kilos of paddy which the farmers can have at 4/00 Rs per kilo more than the prevailing price in the local market. He further claims that the union which has now started a mill has produced more 1,600,000 kilos of rice so far to the national market. The project is a joint venture initiated by the Government Agent, RAHAMA with FORUT funds, and cooperation of the farmers union. The challenges for the union are to reduce the loans of its members who have obtained various kinds of loans for the production of paddy due to resource constrains. The union feels if the micro finance scheme is developed the business could be further enhanced and production demand could be high. Moreover it is also an important issue to develop the irrigation facilities to ensure the supply of water for better production. Have you achieved your objectives? The General Manger says most of it. We have started the purchase of paddy by giving the farmer a better price, we have employed women for this project, and we are supplying inputs though our loan programs and we sell quality rice at a reasonable price. What are other issues pending? Well we need more stores to expand our services. Due to the capacity problem we have rented out another store to help the farmers to sell the produce to us. We are planning more facilities such as organic farming methods, organic fertilizer production etc. to reduce the use of chemicals among the farmer.